Now, many manufacturers have figured out how to “copy-protect” discs. A copy-protected discâ€”like a cartridgeâ€”can’t be copied or changed. Here are the six best buys in home computers; one is the perfect machine for you. Now that you’ve discovered what computers can do for youâ€” from word processing to database management, from better-than-arcade games to educational programsâ€”you may also find that choosing which machine to buy can seem hopeless. If you’re thinking of joining the computer revolution, consider these six best buys that we chose out of the dozens in the computer world. Computers are priced a bit differently from other things you may have bought. For one thing, there is no “standard” setup recognized by all the companies. It’s as if all four wheels were standard on one model of automobile and optional on another. The variations can make comparison shopping a chore. All six computers we chose (Apple II, Atari 800, IBM Personal Computer, Commodore PET, Radio Shack TRS-80 and Texas Instruments’ 99/4A) have various features in common. For one thing, they’re all programmable in basic, which is the most popular of all * personal-computer languages. It is similar to English and easy to learn. 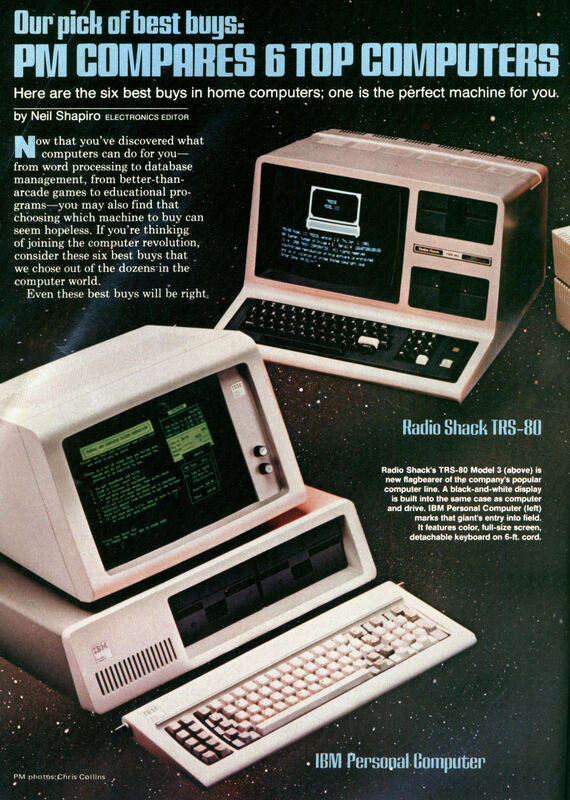 But what happens when you find that the Apple II offers two forms of basic and so does Radio Shack? Our chart does a lot of the factfinding work for you. All the computers are specified with floatingpoint basic (which includes decimal numbers and integers), and approximately 48K (48,000 bits) of programmable memory (as much as all but the Appleâ€”64Kâ€”and the IBMâ€”256Kâ€”will accept). We’ve also priced these computers with one disc drive apiece (a disc drive lets you retrieve and store programs and data far better than a tape recorder). And our pricing includes all the additional hardware each computer requires to use that drive. Though the factory-equipped Apple has just 40 columns across, an additional plug-in board (Videx Videoterm) can bring it to 80-col-umn capability, too. “Columns” and “characters” are used interchangeably in computer talk. The Radio Shack TRS-80 Model 3 has a 64 character line. In most cases, this is sufficient for columnar matter. The PET is available as the CBM, which features an 80-column line length. But the CBM doesn’t have the PET’s graphics capabilities. The other computers on our best-buy list have line lengths that may prove too cramped for some home or business uses. You can’t use the same monitor for color graphics as for 80-column lines. So, for the IBM and the Apple (modified with the Videx plug-in) you need two monitors. (Color monitors blur tiny black and white letters.) But, by the time you read this, that may have changed; Amdek will soon be releasing a color/80-column monitor for both of these computers. As writers, we’re loathe to admit that a picture can be worth a thousand words; but that’s often the case. And it’s no different in the computer world. All these computers will let you draw designs, bar graphs, pictures and artistic graphicsâ€”the Radio Shack and PET in black and white, the others in color (on a color display, of course). Computers’ graphics capabilities are rated in pixels or points of resolution. Different computers divide the same size screen into points of different sizes that can be turned on and off. The Apple’s low-resolution screen (40 points high by 40 points wide) gives a total of 1,600 possible points (at this resolution, the points are more like square blocks on most displays). But a resolution of 280 by 192 (the Apple’s high-resolution screen) produces 53,760 addressable points. Obviously, it’s easier to draw a very smooth curve with a screen of 53,760 points than with one of 1,600. As would be expected, the two black-and-white computers are easier to program graphically than their color counterparts. The PET, in particular, offers a unique system of 128 special characters. One special character, for example, is a heart shape. So programming a picture of the ace of hearts is easy. When the image you wish to program is not among the special, preprogrammed characters, you can “stack” lines, curved sections and other shapes to form the character you want. Radio Shack uses large, blocky points or a collection of special shapes. The Shack’s shapes are irregular building blocks, rather than objects. IBM, by the way, requires a $300 graphics interface to run color. We have included that in the price in the chart. IBM uses a new system of drawing in which you give the computer commands like U20R10 for “up 20 units, turn right 10.” The system is easy to use for line drawings, but, as on the other computers, things do get more complex. The Atari 800 has two brainsâ€” and it’s no dinosaur. One of its CPU (central processing unit) chips is devoted entirely to graphics. This makes the Atari capable of swifter animation than the other machines and also allows for nine different modes of graphics. 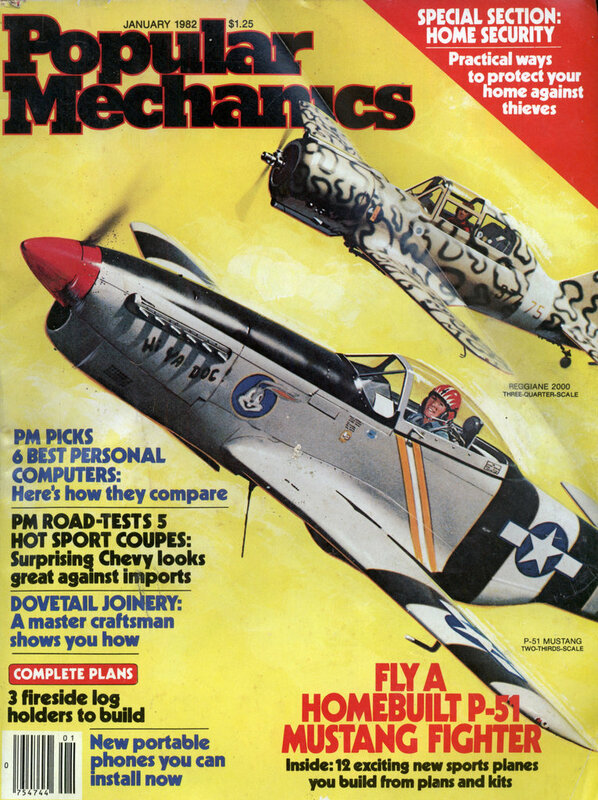 But complex graphics are very difficult to program (though a lower level of graphics offers little difficulty). But no matter which you choose, graphics won’t come overnight. If you’re like 999 out of 1,000 people, you’ll be depending on prewritten software to help you design graphics. All the companies which make these computersâ€”Radio Shack, Apple and the rest of the groupâ€”are referred to as “primary manufacturers.” Companies which make software or hardware to “fit” one of the machines (see Ways to ‘Talk’ to Your Computer, page 85) are called “secondary manufacturers.” It’s a bit like the automobile aftermarket, with one major difference: What you buy after you get the computer is as important as the computer. When you bring them home, you can do more with the Apple II and the Radio Shack TRS-80 than with the other units. Because these two have sold the most units and have the greatest number of users, they’ve attracted the most secondary manufacturers. For either computer, you can buy thousands of programs. Besides the disc drive from the manufacturer, you may want other add-ons, such as a printer, a modem (to communicate via the phone with other computers), a speech synthesizer, appliance control, voice-input and others. In this category, Apple is the winner, with Radio Shack second and the others far behind. That’s because the Apple was designed with eight plug-in slots on the main circuit board. These slotsâ€”called I/O or input/output portsâ€”were an open invitation for others to design accessories to plug into them. The Atari 800 has just begun to catch on. If the trend continues, by year’s end, the Atari owner, too, will have access to a world of software add-ons. The IBM computer has already inspired quite a few manufacturers to begin programming and tooling up. However, it may be more than a year before these efforts appear in the computer stores. One thing about computersâ€” they’re all going to fail, sooner or later. Radio Shack has, we think, the best service setup. Any Radio Shack store can send your computer to a regional service center. Usually, it’s returned within a week. IBM will likely have excellent service support, too. As of this writing, though, the service is unproven. Texas Instruments has a number of regional centers. Work is precise and priced reasonably. But we’ve heard that repair can take two weeks. Commodore used to have the worst service of all, but has improved lately to about the same level as Texas Instruments. None of these computers will prove to be orphans. All the companies will stand behind them. Just remember, you’re the one who’ll be using the machine. Like any other tool, it should fit the job you want to do. If you own a record player, you can take one of your discs to a friend’s house and play it on his stereo, even if you have two different brands of gear. But if you have a computer program, it won’t run on your buddys computer systemâ€”unless he has the same brand computer. Even if the program is the same as one for that brand computer, but formatted for a different brand, it won’t load. All computers use different formats for storing and retrieving programs. Here are the three formats. computer organizes these into words called bytes.) Each binary “pulse” is assigned an audio frequency. By recording the binary pulses as tones, programs are stored. By decoding the tones into pulses, the programs can be loaded into the computer. On tape this is slow, but it’s better than typing in a 100-line program every time you want to use it. But for data storageâ€”forget tape. If you have an hour-long tape and the information you need is at the tape’s end, it will take an hour to search for it. never come off. Instead, jacket and all are inserted into a disc drive, where a record/playback head reads the disc through a cutout in the jacket. The discs spin at thousands of revolutions per minute. A disc with a radius of only 5-1/4 inches can store about 200,000 bits of information (each “bit” has room for a letter of English). A disc stores or retrieves programs and data in just a few seconds. Cartridges: Many computers accept plug-in cartridges. We don’t like them for many reasons. First, they’re expensive, compared to tape or disc. But more important, their programs can’t be studied or changed. On the plus side, even a child can use a cartridge. They load instantly and are impervious to fingerprints and other abuse. What’s really odd is that the most advanced of those computer was actually the one with worst software. The TI99-4A had a new novel CPU which made it a great choice for multitasking. In fact it would have been able to do task-switching considerably faster than just about any other processor. To bad the rest of the hardware was so badly designed that it only had about 256 bytes of RAM and 16 kBytes of RAM it could only access via the graphics chip. The software was even worse. You couldn’t access most of the hardware and no peek or poke was avaliable in the standard BASIC. Loved my Apple ][, later replaced with a //e. I helped my friends make a Super 8 SciFi movie using it. I did the 2001-esqe instrument readouts. Too bad hardly any (none) of the images used in the film appear. I really, really have to YouTube the movie. PS: I souped up my Apple with a third party co-processor that came with an AppleDOS patch. I also purchased a Beagle Brothers (I think) program to draw in the little used HiRes mode. Surprisingly, I was able to run both at once! Wow! That’s really awesome. Those were some rad graphics for an apple II. I’d love to see the movie. Did the stuff actually animate at a viewable speed? Or did you just do it frame by frame for the camera? (I saw you had the camera controlled by the computer too). Only the “Striped hills going up and down” were made by my Apple//e, not the jet or paper airplane. They look so cool in color! No… not real time viewable. It’s been decades, but I think the complicated images took several (10 maybe) minutes per frame. I was able to hold the shutter open as long as needed for multiple color exposures. That also gave me brightness control. A good analogy would be stop-motion photography. I switched to a 16mm later. How would this be done in the present? Can modern SD memory camcorders even do stop motion? Long exposures? I get enough spam now, a little more won’t hurt. Send me your email address and I’ll email you the CineMagic article, after I scan it. Mention “Asteroid” in the subject line. 1985 Apple //e computer amimation! @jayessell Thanks for posting that vid. Really amazing use of the tech. In regards to the original article, I think the guy writing it, Neil Shapero, the electronics editor, had a slightly tenuous understanding of the tech. He apparently has never heard of Manchester encoding, as he erroneously states that data stored on a tape is just the data stored as high and low beeps. Good luck trying to do that without some sort of clock multiplexed in with the data. Well each “bit” can only be a 1 or 0 so unless you only ever intend to use 2 letters out of the possible 26 available in the English language, oh, and then there’s things like ‘space’ which might come in useful, you’re gonna be SOL. Unfortunately, very little has change in the tech jurno world. I read several articles every day put out by large news organizations which have pretty obvious errors that anyone with even the slightest understanding of computers would know were wrong. My pet peev is calling flash storage in devices ‘memory’ or worse ‘RAM’. What hope have lay people reading articles/reviews got if those writing them haven’t got a clue. @Cageybee — Microcomputer cassette interfaces of the era generally used a very simple two-tone sort of encoding, not much unlike 300 baud modems. For the Apple II series, for example, a zero was a full cycle at 2 kHz and a one a full cycle at 1kHz, making for bits of variable length. It’s obvious that by a “bit of information” the author really meant a byte. That is very sloppy usage, given the technical meaning of a bit, even if it might be reasonable in a more general sense (bit as in a little piece, such as “a bit of cheese”). I’m curious — why are flash storage devices not “memory”? Do they not remember things? In many embedded systems the built-in flash is even addressed as memory in the main memory space (at least for reads). Well flash storage used in computing is analogous to a hard disk, in that it is used for data and program storage. In that way it’s also analogous to a cassette tape used for mass storage, but you wouldn’t call that ‘memory’. The term ‘memory’ is widely accepted in computer science as working memory, i.e. RAM. Unfortunately, due to the general dumbing down we see all to often today, the difference is being lost, not helped by journo’s who don’t understand the difference. I’ve lost count of the reviews for phones, tablets, etc, that state that they have 16,32 or 64GB of memory. That’s incorrect and unfortunately just propagates the misunderstanding leading to confusion for consumers who might not understand the difference between ‘memory’, or RAM and ‘Flash memory’ or mass storage. In regards to embedded systems, sure I guess you can map flash storage in that way. I’d say it’s only done for convenience sake though as it’s still very much a separate entity . Any data within the flash area would still need to be copied into RAM in order to do any sort of processing/calculations on it.